Many a times it happen that we want to use personalized alphabets for our project but we cannot use it because it is not in built in the digitizing software. Days are gone when you have to use the inbuilt embroidery fonts available with your digitizing software. Now, you can use any fonts for your embroidery digitizing. Just download and install the fonts on your computer and then convert the true type fonts to embroidery digitizing alphabets with in few steps. Yes this is possible, you can use any of the true type fonts with your digitizing easily and can personalized your project easily.Now, no need of depending on the in built fonts available. How to convert my fonts in to Embroidery Fonts? 2) Once you select the options a dilogue box with a name of the fonts will open. Please note that it will show you the name of the fonts which is install on your PC, if in case if you do not get the fonts you are looking for then download the fonts from Internet and double click on the downloaded fonts to install it.Only the fonts install on your PC will appear here in the list. 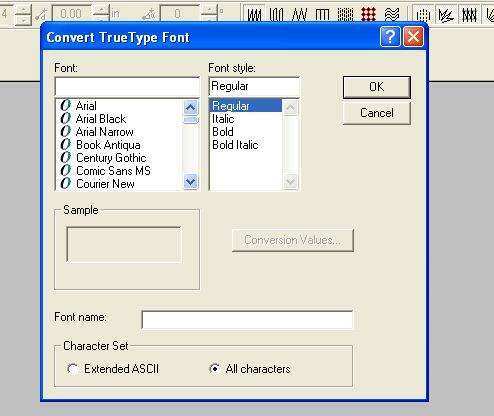 Please note that the time to convert the fonts will be depands on the type of fonts you are converting and processing speed of your PC.If you are converting a simple fonts then it will convert it with in the 5 minute, but in case if you are trying to convert a complicated fonts then it will take more time. But it will take minimum 5 minute to complete the conversion. Now that its, it will convert your fonts.Now you can use your fonts to personalized your project with your selected fonts. To use the fonts, right click on the 'Alphabet' tools from toolbar and digloue box will open with a option to select the type of fonts and content box to type your letters. After clicking 'Ok', CLICK ANYWHERE ON THE SCREEN OF THE WILCOM and the content you have type will appear on the screen as shown in the image. Now you can digitize the content with using various tools like Complex fills, Fusion fills etc or else can digitize the designs using automatically digitizing function.